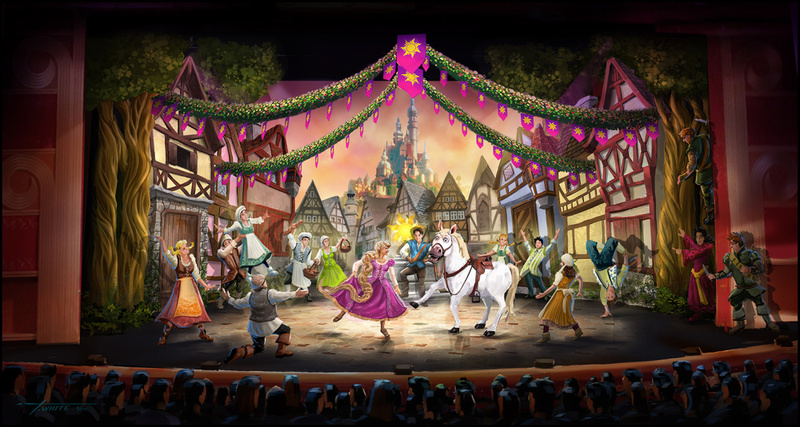 A stage show adaptation of the Disney animated film Tangled is set to launch on Disney Magic in November. The original stage show production is the first time that Tangled has been adapted for the stage. Tangled: The Musical will immerse audiences in Rapunzel’s fairy-tale world through lavish production numbers and spellbinding music. The show will stay true to the storyline from the hit feature film—with a few special twists to create a live staged production—featuring favourite characters like Rapunzel, Flynn Rider, the villainous Mother Gothel and Maximus the police horse. Elaborate costumes, ground-breaking puppetry and vibrant set designs will transform the 977-seat Walt Disney Theatre into a Bavarian kingdom, immersing audiences in Rapunzel’s world. Master puppet designer Michael Curry, whose extraordinary creations are featured in Disney’s Tony Award-winning musical The Lion King on Broadway, will craft Maximus the police horse. Tony Award-winning designer Paloma Young will design an array of dazzling costumes and the set will be designed by scenic designer Bradley Kaye who worked on Disney’s Aladdin—A Musical Spectacular. Tangled: The Musical complements the line-up of Disney Cruise Line-exclusive live entertainment performed every voyage aboard the Disney Magic, joining Twice Charmed: An Original Twist on the Cinderella Story and Disney Dreams… An Enchanted Classic, which will feature a new segment from the blockbuster animated hit Frozen from this summer. Tangled: The Musical will première during the four-night Bahamian sailing aboard the Disney Magic departing Miami on 11 November. Disney Magic will sail four-night Bahamas and five-night Western Caribbean cruises from Miami from September.